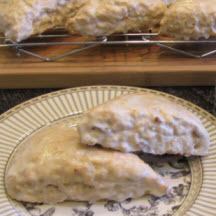 CooksRecipes has quality, kitchen-tested recipes for sweet and savory scones that you can count on for successful deliciousness. A thin vanilla glaze adds just the right touch of sweetness to these scrumptious scones filled with pieces of tart green apple and plump golden raisins. 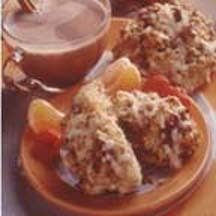 Savor the enticing flavor of these cinnamon-scented scones, laced with toasted chopped pecans and drizzled with a simple orange icing with your favorite hot beverage. 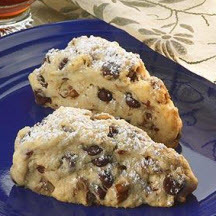 Teatime or anytime, these delicious scones, studded with dark chocolate chips, are wonderful with a steaming hot cup of tea or coffee.